United Kingdom Horse Events Directory - O Horse! A comprehensive overview of the Champion Hurdle, a Grade 1 hurdle race for four-year-olds and upwards, traditionally run on the opening day of the Cheltenham Festival. 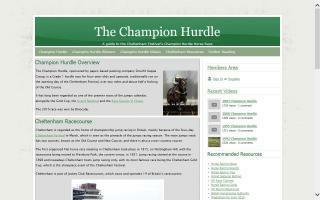 Featuring general information on the race, its history, trainers, jockeys, and winners as well as videos of past races.